When you have a craving for cheesecake but need to stick to your low-carb diet, give this recipe a try. It is sweetened with agave syrup, a common sugar substitute, and features a gluten-free crust made with almond meal. The result is a delicious dessert that has fewer carbs than a traditional cheesecake. It tastes great, has a nice density, and is just waiting to be topped with your favorite fruits. You can bake this cheesecake with or without a water bath. The water bath simply means that you will place your foil-wrapped baking pan in a water-filled pan. It's a preferred method that can keep your cheesecake from cracking, but it's not required. First, heat oven to 375 F. If you have bricks, a pizza stone, or an unglazed ceramic tile, place them on the lower rack of the oven. By filling your oven with extra oven-safe items, you will hold more heat in the oven. It is a good trick for cheesecakes not baked in a water bath and actually works well for all types of baking to keep a constant oven temperature. Many bakers choose to leave things like pizza stones in the oven most of the time. In a small bowl, combine the almond meal, melted butter, and 2 teaspoons agave syrup. Raise the oven heat to 400 F if using a pizza stone. Lower it to 350 F if you're using a water bath (see below). It's very important that you add the cheesecake ingredients one at a time. If you don't, your cheesecake will not set properly. Read the following instructions carefully and you should be okay. In a large bowl, beat the cream cheese with a mixer until smooth and fluffy. Add the eggs, vanilla, lemon juice, remaining agave syrup, and Greek yogurt, scraping the bowl and beaters after each ingredient you add until it is fully incorporated before adding the next ingredient. When all ingredients are combined, scrape one more time and beat for 1 minute. Pour the mixture into the pan on top of the crust. Wrapping the pan will prevent any water from leaking into it and keep any cheesecake from leaking out. If you forget this step, you might have a mess in the oven. Wrap the bottom and sides of the springform pan in foil. Place it in a larger baking pan and pour boiling water around the sides to come halfway up the pan. Bake at 350 F for 60 to 90 minutes, checking it often. When the cake is firm to touch but slightly soft in the center, or the center reaches 155 F, remove from the oven. For this method, you start the cake at a high temperature, and then reduce it. This will help reduce the chance that your cheesecake will crack. Put the cheesecake on a baking sheet in case it drips and place it in the hot oven. Close the door and immediately turn the oven down to 200 F.
Bake for 60 to 90 minutes, checking often after 1 hour. When the cake is firm to touch but slightly soft in the center, or the center reaches 155 F, remove it from the oven. When the cheesecake has reached room temperature, refrigerate it in the pan until it is completely cold (at least 2 hours). Remove the springform collar and cut it into 16 pieces. Top with fresh fruit, if desired. 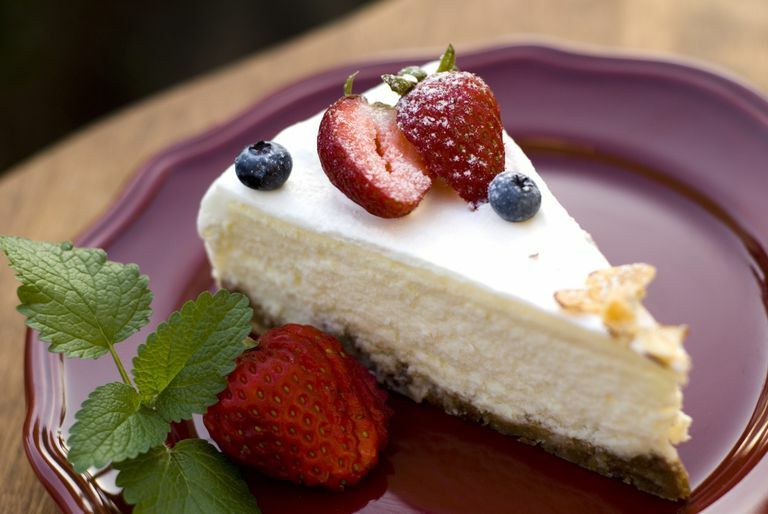 You can use a low-fat cream cheese, though a cheesecake does need some fat or it won't hold together well. If you like, substitute 8 ounces of low-fat cream cheese for one of the 8-ounce packages of regular cream cheese. This tends to work well, even though the batter seems a little looser. There is only a slight difference in the final product. The cheesecake is fairly dense and becomes more so when completely cold. For this reason, it's best to serve it straight out of the refrigerator. Top your cheesecake with any fresh fruit you like. Strawberries are a great choice, especially when they are in season.